Are you looking to work for a company that not only allows for professional growth but encourages it? Schneider prides itself on providing its driver, warehouse, diesel mechanic and office associates with countless opportunities for not only development but advancement. A great example of such an opportunity can be found in Jay Hull’s career with Schneider. Jay joined the U.S. Army when he was 17, ultimately spending 24 years in military service, with a variety of roles, including driver, recruiter, career counselor and chemical, nuclear and biological warfare specialist. 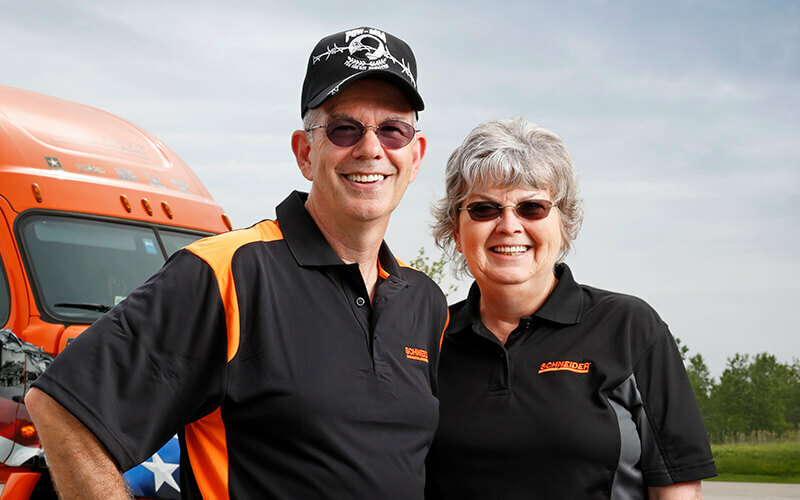 After retiring from the military in 2005, he drove for a small company for a few years, which is where he met his wife, Robin, who was a dispatcher at the time. Robin ended up getting a job with Schneider, and she referred Jay — she got a referral bonus and he got a sign-on bonus. Jay started working for Schneider in 2012 out of the Chicago, Ill., Intermodal yard as a Regional Intermodal driver. After nine months, Jay transitioned to a training engineer and then began driving the 2008 Ride of Pride truck that hauled Intermodal freight out of Chicago in 2014. 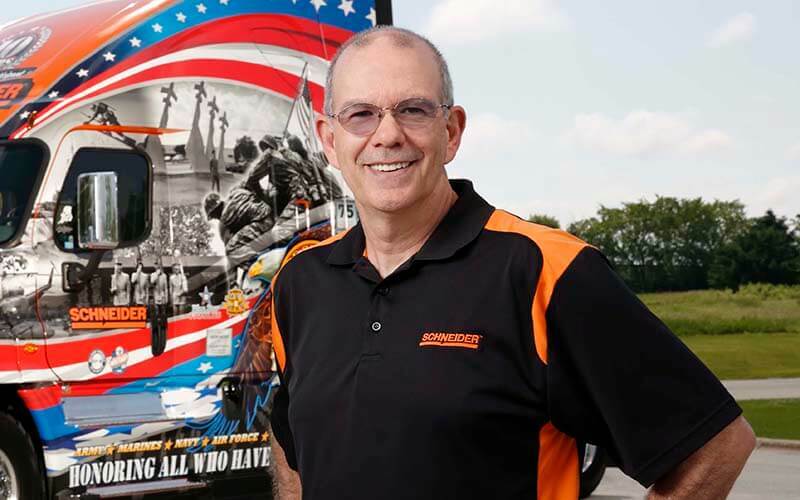 In 2015, Jay was selected to drive the Schneider Ride of Pride truck which traveled across the country attending job fairs, visited driving schools and even participated in Wreaths Across America. Watch the video below from 2015, and read Jay’s 2016 reflection on being a Ride of Pride driver. As Jay’s year of driving the Ride of Pride truck came to an end, he started contemplating what was next for him. Jay’s wife Robin suggested Jay do a sit-in with a driver recruiter in Green Bay, Wis. After Jay completed the sit-in, he decided being a driver recruiter was a role he wished to pursue and for the past two years Jay has been working as the Military Driver Recruiter out of the Driver Training Center in Green Bay. Jay’s transition from the cab to the desk came with one main reservation: giving up his “me time” in the cab. However, Jay’s excitement for the opportunity to help veterans adjust to civilian life was much greater than this reservation. When asked what he enjoys most about his transition to driver recruiting, Jay said, “being home every night and having the opportunity to build rapport and hire veterans.” When transitioning from the cab to the desk, Jay remembers feeling very welcomed by his teammates. Working in the office took some adjustment, but Jay’s team and supervisor helped him with his transition. During Jay’s first week, he enjoyed lunch with his supervisor and completed training provided by teammates and other associates. Jay openly admits he is not an IT guru, but his team helps him to succeed and Jay benefits his team by providing expertise in other areas such as what drivers can expect from their truck. Many people don’t realize that working for Schneider provides not only office associates but also driver associates with many opportunities outside of the cab. Interested in starting a driving career with Schneider? Search driving jobs and apply. Interested in coming out of the cab? Search office jobs and apply. Do you have any questions about career transition opportunities at Schneider? Comment below. Andrea has been with Schneider since 2012 and is currently a Driver Recruiting Program Coordinator. Prior to joining Driver Recruiting, she worked in Maintenance as an Equipment Sales Maintenance Coordinator and as an Inventory and Sales Support Representative. She enjoys playing volleyball, completing DIY projects and watching the Green Bay Packers.